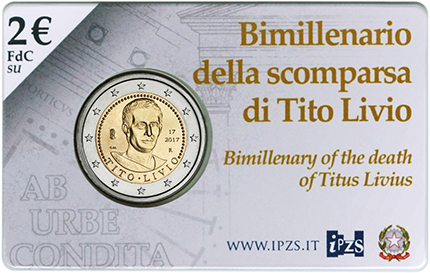 The Istituto Poligrafico e Zecca dello Stato, or IPZS, Italy’s state minting facility have issued (23rd June) a new €2 coin which marks the occasion of the bi-millenary of the death of one of the Roman world’s most important historians, Titus Livius (59 B.C.–17 A.D.) Livius is pre-eminently remembered for his work Ab Urbe Condita (The History of Rome from Its Foundation), the most important history of Rome and a comprehensive chronicle of the Roman people from its origins to the age of Augustus. 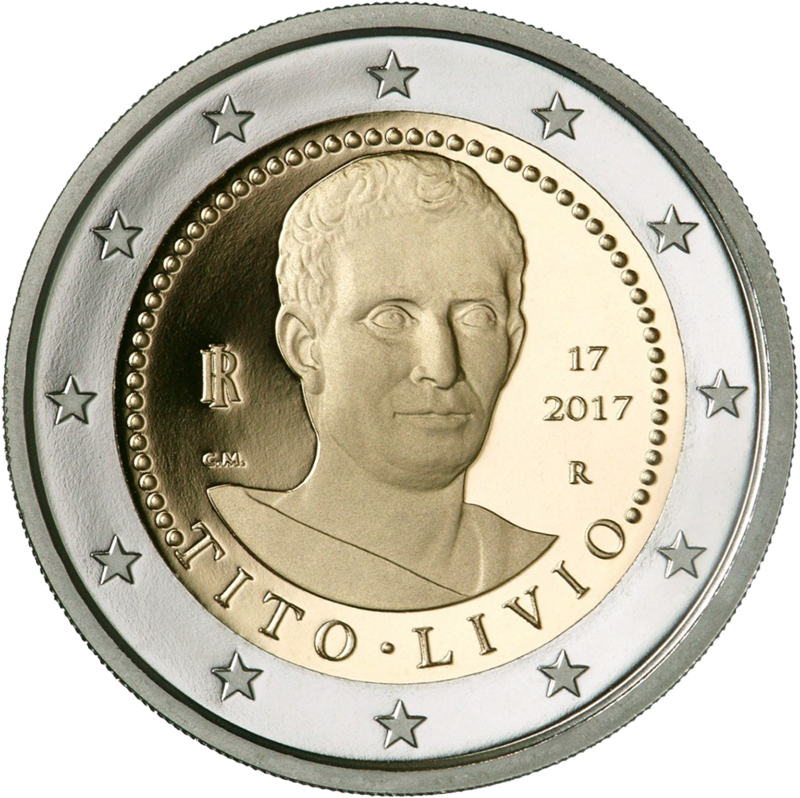 The coin is designed by Claudia Momoni and depicts a bust of the Roman historian Titus Livius, from a work by Lorenzo Larese Moretti. To the left is the monogram RI (for the Italian Republic), with C.M. (the initials of the designer) in smaller letters below. To the right, the years 17 and 2017 mark the year of Titus Livius’s death and the year of the coin’s issue, respectively; the letter R, below, identifies the Mint of Rome. 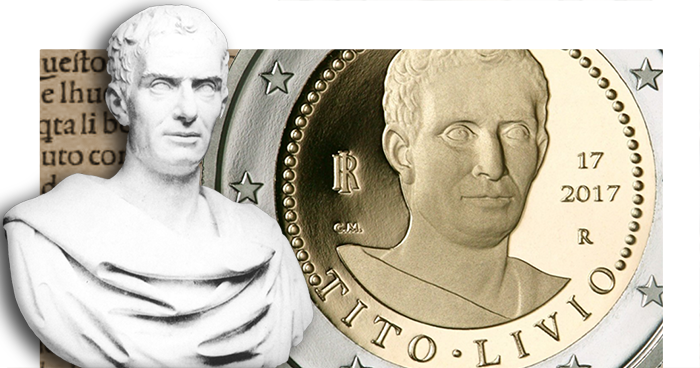 The design is surrounded by a dotted border with the inscription TITO • LIVIO below the portrait. On the outer ring, 12 stars represent the European Union. 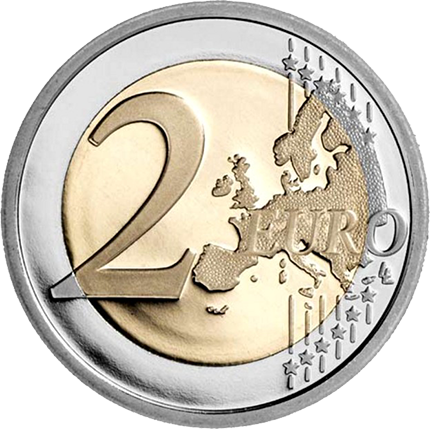 The reverse design is the standard euro circulation motif, which includes the numeral 2, a map of the European continent, and 12 stars. The coin is available in Proof and Brilliant Uncirculated examples. The Proof coin is presented encapsulated within a custom box; the BU examples are sealed in a coin-card presentation. Please visit the website of the IPZS for additional information for this and other coins on offer. 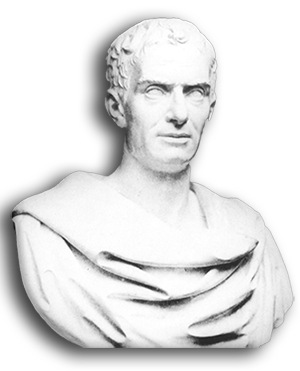 Titus Livius was born in the village of Patavium (modern-day Padua). Little is known of his parents, but there is clear evidence of his rural origins, based on his Patavian accent that was apparently ridiculed by fellow historian Gaius Asinius Pollio (75 B.C.–4 A.D.). Patavium belonged to the province known as Gallia Cisalpina, and its governor at the time of Titus’s youth was none other than Julius Caesar. Perhaps it was the stories told about the wars in Gaul that piqued the interest in history for Livius to want to record or chronicle the events he learned about. However, his writings indicated he knew next to nothing pertaining to military matters, nor did he know anything about warfare. Under ordinary circumstances, this lack of a military comprehension together with his lack of political experience would have disqualified him as a historian, but his ability to record contemporary events enabled him to write about Rome’s history with accuracy and passion. The great civil war which broke out between Caesar and Pompey occurred when Titus was about ten years old. The battle of Pharsalus occurred in the year 48 B.C. ; Livius would later recall it as a miraculous incident in history, although his own description at the time was lost. After the violent death of Julius Caesar at the hands of his own senators in the senate chamber, a new round of civil war followed, and Patavium played a minor role in the fighting. It is possible that the young Livius witnessed some of the fighting between the years 44 and 43 B.C. first-hand. By the year 31 B.C., Caesar’s adopted son, Octavian—who had gained power after defeating Mark Antony and Cleopatra—was given the honorary name of Augustus. (It is known that there was a kindred relationship between Titus Livius and the wife of Augustus, Livia; they were from the same clan though in different locations and were not related by blood.) Augustus was also victorious in putting down insurrection, and many Romans believed that after 18 years of fierce infighting, the situation in Italy would stabilise. Livius may have shared in this sentiment, since he managed to publish the first five books of his History of Rome from Its Foundation between 27 and 25 B.C. Livius was now in his early 30s, and although not much was known about his private life, it could be arrived at that a Roman man of his age and stature would be married and have children. The rhetorician Marcus Fabius Quintilianus (35–100 A.D.) records that the historian indeed had a son, for whom he wrote a treatise on style, and a daughter, who may have married a teacher of oratory named Lucius Magius.